I would like to thank you for your role in helping Darius Speaks, a young player that I work with, get an opportunity to further pursue his dreams. This time last year, Darius was a 6-4 guard playing out of position at Crossland HS in Prince George's County, MD. Although he had an impressive season, he was overlooked both in the recruiting process and in post season recognition(awards, all star teams, etc.). I contacted Pennington Greene as I do periodically, shortly after the Capital Classic All Star Game rosters were released and I saw that Darius was not on any of the rosters(for the main game or the preliminary games). I began to tell Penny about Darius and he asked to see video, which I emailed to him. Less than 48hrs later, Darius was added to one of the preliminary game teams. He responded by being one of the game's leading scorers with 16pts, while also chipping in with 4 rebounds and 3 assists. This performance led to interest from prep schools(he committed and is playing with Mt. Zion Prep), which led to D1 offers(Darius committed to Coppin State University this fall). 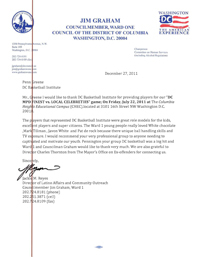 Thanks again DC Basketball Institute for all that you have done.